The first week of April Dr. Jack Dillenberg headed off to Las Cruces, New Mexico to give a keynote speech at the 2012 Healthcare Workforce Summit to health care professionals, policy makers, and academicians focusing on the health needs of rural New Mexico. The focus of his keynote speech was on the integration of oral health and total health, and the development of ASDOH, as an innovative community service based dental school, to help meet the oral health needs of the underserved citizens in the neighboring state of New Mexico. 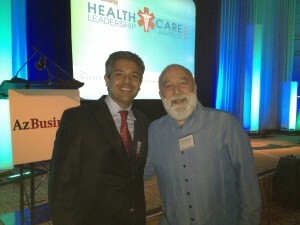 Charlie Alfero, Director of Hidalgo Medical Services, and Dr. Jack Dillenberg were both speakers at the 20120 Healthcare Workforce Summit. Dr. Jack Dillenberg stayed in town (for a change) and attended the Western Regional Dental Convention, which is the annual meeting of the Arizona State Dental Association. A number of ASDOH graduates also were in attendance. In addition, several ASDOH faculty members presented continuing education courses, including Dr. Robert Levine and Dr. Maureen Romer. While at the convention center, Dr. Dillenberg attended a course and had numerous informal meetings with Dental manufacturer representatives and leaders of the state dental association. 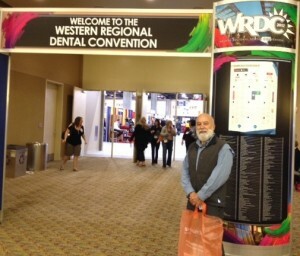 Dr. Jack Dillenberg met with many other dental professionals at the Western Regional Dental Convention in Phoenix, Arizona. 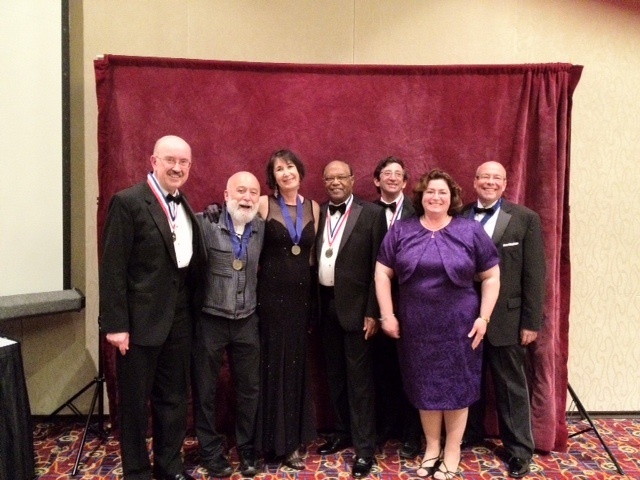 After a wonderful vacation in Key West, Dr. Jack Dillenberg joined other ASDOH faculty and administrators, both as participants and presenters, at the ADEA annual meeting in Orlando, Florida. Dean Dillenberg attended the Dean’s Council where they discussed the new CODA standards and welcomed a number of new deans and new schools of dentistry. The House of Delegates voted to grant initial membership to ATSU’s new Missouri School of Dentistry & Oral Health (MSDOH). While Dr. Dillenberg was in Orlando, Dr. Chris Halliday, MSDOH’s Dean, attended the groundbreaking of the new dental school on the Kirksville campus. 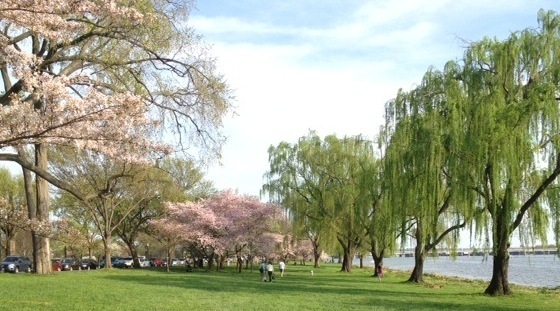 After a quick day back on the ASDOH campus, the Dean left for Washington D.C. to be inducted into the National Academies of Practice (NAP). The organization promotes interprofessional collaboration and education to improve health, decrease costs, and to promote an efficient health care system. Membership is by invitation only. While in Washington D.C., Dean Dillenberg visited with Dr. Steve Corbin, the Senior vice-President of Special Olympics (SOI), to discuss further collaboration between ASDOH and SOI. He was also interviewed for their newsletter publication. Cherry blossoms bloom in Potomic Park, Washington D.C.
Cherry blossoms were at the height of the season in Washington D. C.
NAP inductees, including Dr. Jack Dillenberg, display their medals. 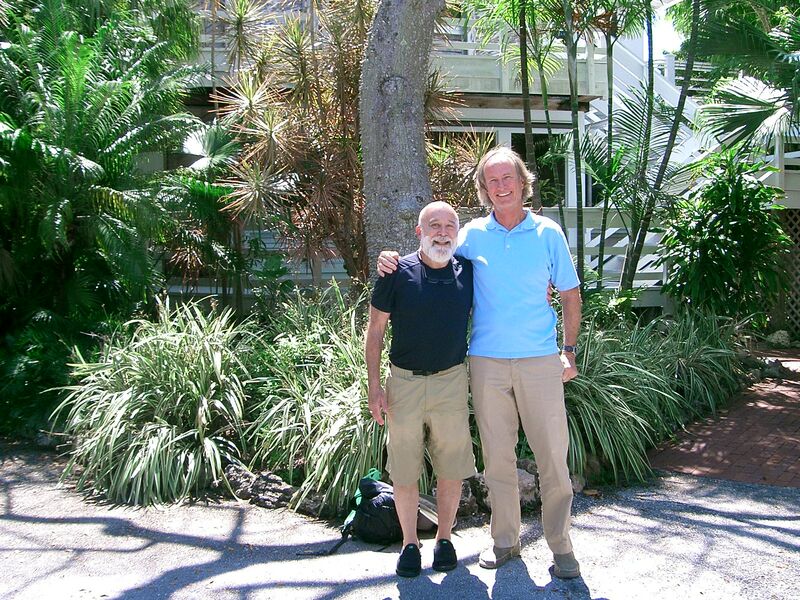 Though he didn’t quite make it in time for the Hemmingway look-alike contest, Dr. Jack Dillenberg did take time to be away physically from the office using Key West as a base for his spring break adventures, while staying virtually connected. 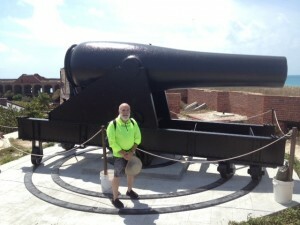 His time away included a boat journey to the Dry Tortugas National Park to see the extraordinary Fort Jefferson built with 16 million bricks in the mid-1800’s. Though never fully completed, the fort did function as a prison and housed the infamous Dr. Mudd, a convicted coconspirator to the assassination of President Lincoln. Today, the Dry Tortugas National Park serves as a wonderful bird sanctuary and home to numerous aquatic life. Dr. Dillenberg also spent time with a friend from his dental school years, Dr. Fred Troxel. He visited his office in the Keys, hidden in the vernal foliage that makes this part of the U. S. so unique. Key West is known for its festive lifestyle and outstanding culinary delights. It is the most southern tip of the United States, an island sitting only 90 miles from Cuba. 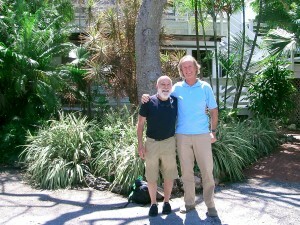 Dr. Jack Dillenberg visits a friend from the past, Dr. Fred Troxel. Dr. Jack Dillenberg poses with a canon at Ft. Jefferson in Dry Tortugas National Park. The Arizona Business Magazine’s Health Care Leadership Award recognizes the accomplishments of individuals and organizations that have made strides in helping Arizonans receive better care. 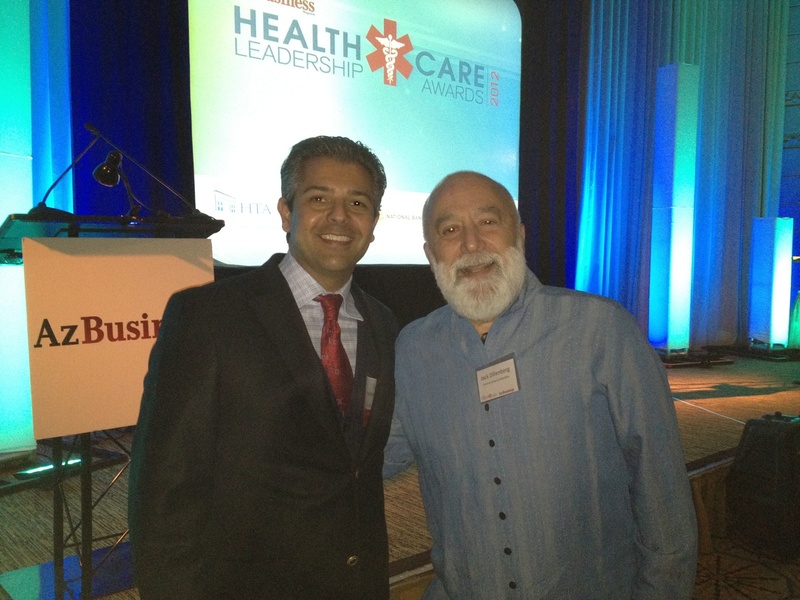 Dr. Tony Hashemian was selected as the 2012 Health Care Leadership Award recipient as Dentist of the Year. 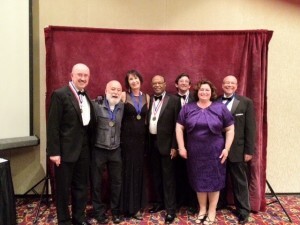 Dr. Jack Dillenberg attended the awards ceremony at the Arizona Biltmore in Phoenix. Congratulations Tony! Dr. Tony Hashemian, winner of the Arizona Business Health Care Leadership Award, is all smiles along with Dr. Jack Dillenberg, a very proud dean. I had the delightful experience of meeting with our former Director, Jack Dillenberg at our AZ Developmental Disabilities Planning Council meeting last week. Our Council meeting was out at AT Still University’s AZ School of Dentistry & Oral Health. It was great seeing Jack again- he hasn’t changed a bit- he’s just as enthusiastic and animated as ever. Most of all- it was great to see the great public health work that the school is doing (he’s the Dean). Not only do they prepare students to practice dentistry- but they encourage students to commit to a lifetime of involvement with communities, including serving folks with disabilities. Check out Jack’s 2 minute video to see him in person. Most folks know that good oral health is needed to prevent oral diseases- which can be progressive, cumulative, and more complex over time. If left untreated, tooth decay leads to needless pain and suffering; difficulty in speaking, chewing, and swallowing; missed school days; increased cost of care. There’s also good evidence that poor oral hygiene and health increases the risk of other systemic health problems like diabetes, heart disease, and adverse pregnancy outcomes. One of Arizona’s biggest challenges is the lack of access to oral health care in the rural and frontier areas of the state. Our Oral Health shop has a HRSA grant that helps us to focus on developing teledentistry… and we’ve been one of the few states piloting this. There’s a report posted on our website describing the pilot. We have 4 enhanced dental team practice models using teledentistry and/or affiliate practice dental hygienists. They include: Northern Arizona Council of Governments Head Start, a pediatric dentist and summer camps for preschool children; a partnership with two IHS dental service units – one in 6 elementary schools for children on the Hopi Reservation and the second in Sells; a pediatric dentist opening a satellite office in a rural area 200 miles from his practice. There are lots of benefits to maximizing the use of teledentistry in the rural parts of the state- but the biggest are improved access, cost efficiency, and better patient satisfaction. The Pew Center on the States released a report this week that shows the need for preventative oral health care in the US. The report highlights the rising number of people with dental problems who end up in hospital ERs. We had the pleasure of meeting with a delegation of health officials from the Republic of Korea (South Korea) this week to talk about Arizona’s Trauma System. The Director General of Public Health policy (Byung Guk Yang, MD) and his team met with our Emergency Medical Services and Trauma System team to talk about how we developed Arizona’s trauma system over the last 3 years. Arizona has gained a national reputation for our ability to put together a solid trauma system in just the last 3 years. When we began our quest to develop AZ’s system 3 years ago we had exactly 0 Level IV Trauma Centers in AZ- and we just signed up our 16th Level IV Center this month. That’s progress. The Republic of Korea’s Health Ministry has been charged with and funded $1B US to develop their national trauma system over the next 5 years. Their delegation wanted to visit Arizona and Southern California to view first hand our systems as they embark on their quest to develop their trauma system. We spent a lot of time on Tuesday working with their team with a focus on the importance of collecting solid hospital and pre-hospital trauma data- so they can use data analysis to inform the development of their trauma system strategy. Please join us in encouraging pregnant women and new moms to sign up for Text4baby. Text4baby is a program of the National Healthy Mothers, Healthy Babies Coalition that provides pregnant women and new moms with information to help them give their babies the best possible start in life. Text4baby is the country’s first free, health education program using text messages. Participating national cell phone companies deliver Text4baby messages to their subscribers at no charge. Pregnant women and new mothers receive expert advice texted directly to their cell phones. The weekly messages are timed to their due date or their baby’s birth date through the baby’s first year. The messages deal with nutrition, immunizations and birth defects prevention, among many other topics. CMS announced today that it will partner with Text4Baby to promote enrollment in Medicaid. Current Text4Baby users are receiving a new message providing a connection to the InsureKidsNow phone number and website for information about how to sign up. So far, 6,000 Arizonans have enrolled in Text4baby since the program started in February 2010. You can help increase Arizona’s enrollment by spreading the word among pregnant women and new families or by encouraging other organizations to sign up as an official partner with the Text4baby program. 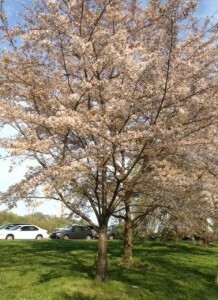 To learn more about the Text4baby Program, go to www.text4baby.org. Take a minute to check out the new and improved HealthCheck Programs website. The HealthCheck Programs include the Well Woman HealthCheck Program and Fit at Fifty HealthCheck Program. Both of these programs are primarily federally funded through the CDC and provide uninsured Arizonans with vital access to breast, cervical and colon cancer screening and diagnostics. The new website is a vast improvement from its predecessor and will greatly increasing access to and awareness of these important programs. While you’re on the site, take a look at the upcoming National Dress in Blue Day (it’s tomorrow) activities on the main page. If you have any comments or feedback on the new site, please send them to christy.zavala@azdhs.gov. Dr. Jack Dillenberg and Dr. Tony Hashemian with Pam Reece at Henry Schein in SLC. Off to Salt Lake, Dr. Jack Dillenberg visited with executives with the Practice Solutions Division of Henry Schein in Salt Lake City. This meeting provided an opportunity to discuss integrating ASDOH’s Text–2-Floss program into their Dentrix software. They also explored expanding this texting format into other oral health-related areas, both domestically and globally.